Note that I have included quite a lot of new or little-known information in this article. So even if you have read about the oddities surrounding the actions of George W. Bush and the Secret Service on September 11 before, you should find plenty of interesting new details in it. 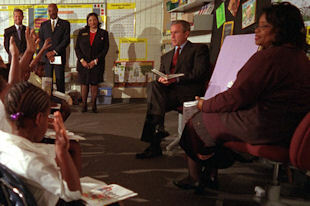 I find particularly interesting the statements of senior officials who were at the Booker Elementary School with the president, in which they recalled their concerns about the school being attacked by terrorists while Bush was there. And yet Bush was still allowed to stay at the school for 40 minutes in the middle of the worst attack on American soil since Pearl Harbor. Shoestring on Sun, 03/05/2017 - 4:26am. Shoestring on Sun, 03/05/2017 - 4:30am. One thing that needs to be pointed out is that Ari Fleischer was holding up a sign that said "DON’T SAY ANYTHING YET." Doesn't seem like he was the "decider" at that time. Jon Gold on Sun, 03/05/2017 - 9:47pm. Great stuff! This article I wrote in 2003 with Paul Thompson might add some additional details. redsock on Mon, 03/06/2017 - 11:41am. This is a classic piece of early 9/11 research, which is still worth reading all these years after it was published. Another article on the subject that is well worth checking out is "Secret Service Failures on 9/11: A Call for Transparency," by Kevin Ryan. You can read it here: http://www.washingtonsblog.com/2012/03/secret-service-failures-on-911-a-call-for-transparency.html. Shoestring on Tue, 03/07/2017 - 9:31am. Another thing worth noting is that, when the president's motorcade left the Booker Elementary School, it initially went in the wrong direction for quite a distance and had to perform a U-turn in order to head for the Sarasota airport. A possible reason for this bizarre incident is that at least some of Bush's Secret Service agents wanted to take Bush back to his hotel. Agents "apparently toyed with the idea of taking Bush" back to the Colony Beach and Tennis Resort "because they might not be able to get the planes ready," Katherine Moulton, the hotel's president, told the St. Petersburg Times. She said an agent at the school called her and assured her that the hotel was "fully protected against anything that might happen." (Source: http://web.archive.org/web/20040707003914/http:/www.sptimes.com/2004/07/04/Worldandnation/Of_fact__fiction__Bus.shtml.) In other words, the motorcade may not have initially been going in the wrong direction; it was simply heading to the hotel. I wonder if some agents planned to take Bush back to his hotel, rather than getting him quickly airborne for his safety, because they believed the reported threat was only simulated. I.e. they thought the reports they'd heard about the World Trade Center being attacked were part of a training exercise and so the president wasn't in any real danger. Shoestring on Wed, 03/08/2017 - 10:39am.